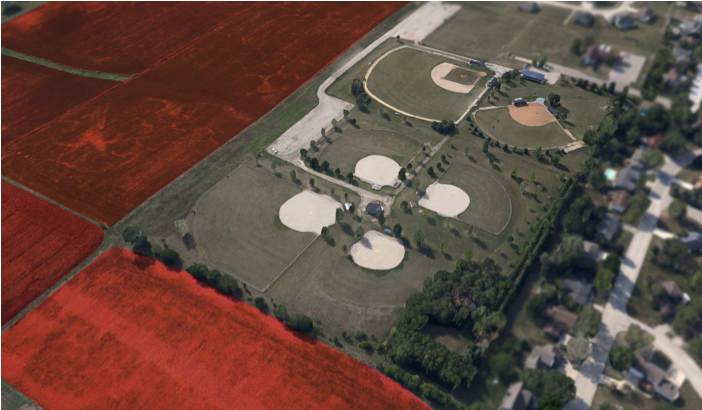 Aerial photo of a town in Iowa shows six baseball fields located right next to cropland (in red) where toxic herbicides are likely to be sprayed. Source: EWG, Adopted from Google Earth Pro, EWG. The Environmental Protection Agency approved the use of Enlist Duo for GMO crops in the 15 states this spring, a decision made shortly before the World Health Organization concluded that glyphosate, the world’s most widely used herbicide, is “probably carcinogenic to humans.” 2,4-D possibly causes cancer, according the world’s leading cancer experts. Exposure to 2,4-D has also been linked to Parkinson’s disease, hypothyroidism and suppressing the immune system. Throughout the Midwest, small towns are dotted with public playing fields and parks, often on the outskirts of town where crops grow nearby. Cropland surrounds many small communities in middle America, encompassing a total of more than 159 million acres (substantially larger than the state of California). And just as spring marks the beginning of a new baseball season, it also triggers the annual ritual of planting of vast acreages of industrial row crops. Before those plants even emerge from the ground, growers typically begin intense use of chemicals to control weeds and pests. EWG researchers did a proximity analysis to determine how many small-town baseball fields and parks near heavily planted corn and soybean cropland are susceptible to potential contamination by the toxic combination of glyphosate and 2,4-D. EWG focused on the six states where the EPA approved Enlist Duo for use on GMO crops in 2014. Since then the agency has approved its use in an additional nine states. Due to limited data availability on the location of parks and athletic fields, EWG narrowed its analysis to small towns in the heart of the agricultural landscape in the six states – Illinois, Indiana, Iowa, Ohio, South Dakota, and Wisconsin. 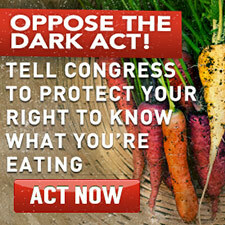 In those states EWG used 2010 U.S. Census data to identify 78 incorporated towns or municipalities with a population of at least 500 people and planted row crop acreage covering at least 50 percent of the total land area (as defined by the 2014 USDA Cropland Data Layer). In the 76 towns that had either a baseball field or municipal park, high resolution aerial imagery from the most recent (2014 except for 2013 in the case of Wisconsin and Ohio) National Agriculture Imagery Program (NAIP) was used to trace the boundaries of those playing fields or parks. In those 76 towns, EWG identified 264 ball fields or parks that were within either 200 or 1,000 feet of cropland that could expose them to drifting glyphosate and 2,4-D. More than 92 percent of the recreational areas were located within 1,000 feet of row crops, and more than 56 percent were within 200 feet. In Ohio eight of nine identified recreational areas (89 percent) were within 200 feet of cropland, as were 44 of 74 in Illinois (59 percent, 77 of 146 in Iowa (53 percent), and 14 of 30 in Indiana (47 percent). Both of the parks or playing fields identified in South Dakota were within 200 feet, as were all three identified in Wisconsin. The sample was limited because of the thresholds used (50 percent corn or soybean coverage and population over 500), but many more small towns are potentially at risk. The same datasets show that in the six states row crops cover at least 25 percent of the total land area in no fewer than 1,424 towns. Despite the small sample size, the finding that 56 percent of identified parks and playing fields in these towns were within 200 feet of cropland planted with corn and/or soybean underscores the public health risk that faces many Midwesterners as a result of the intensifying use of the toxic pesticides glyphosate and 2,4-D on GMO crops. 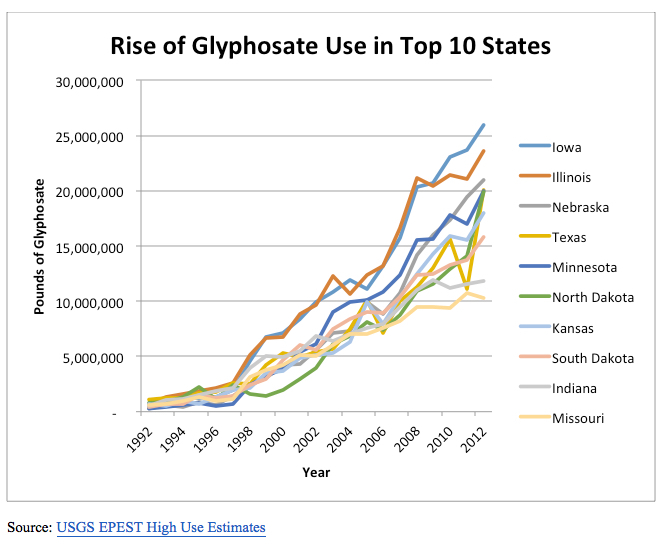 The use of glyphosate in particular has skyrocketed since GMO corn and soybeans came online. The U.S. Geological Survey estimates that glyphosate spraying increased 16-fold between 1992 (before GMO corn and soybeans came on the market) and 2012. The top 10 glyphosate-consuming states – shown below – accounted for 65 percent of all glyphosate use in 2012 (the most recent year of available data). The U.S. Department of Agriculture now estimates that EPA’s recent approval of Enlist Duo on GMO corn and soybeans will lead to a seven-fold increase in 2,4-D use by 2020, compared to 2011. 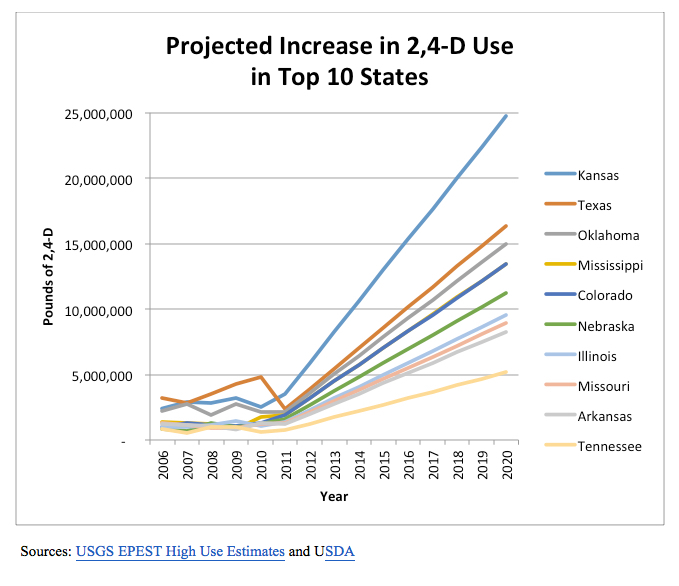 The chart below shows the projected increases in each of the 10 states that currently spray the most 2,4-D.